A few words about Limenas-Thassos..
On the northeastern seashores of the island, at the bay formed between caves “Pahi” and “Evreokastro”, is situated the ancient and current capital of the island, Thassos or Limenas, as it is usually called by the locals because of the existence of three ports in the area. Frequent public transport services operating between Limenas-Keramoti creates a natural bridge with the nearest land. Considering the many government services gathered here, makes it the centre of communication with the rest of the country. The ancient history of the area is apparent around the town with ruins of ancient temples, the wall of ancient Agora and the Acropolis. In the forest above the harbor lies the ancient theatre where in summer one can watch ancient theatrical performances and various concerts. 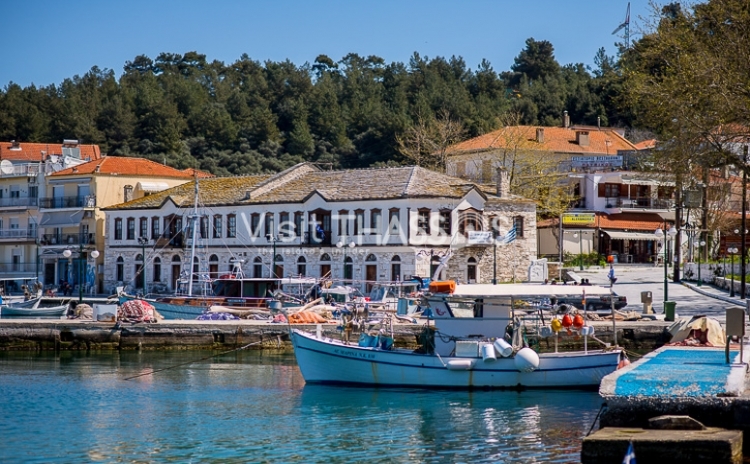 A two-store building, ‘Kalogeriko’, which belongs to the Monastery of Vatopedi, graces the picturesque old port and hosts numerous artistic and cultural events in its fully renovated halls, such as painting and photography exhibitions, conferences and musical tributes. The archeological museum of Thassos houses numerous exhibits from different eras, sculptures, vases, silver and gold coin collections dating back to different centuries BC. The capital of the island is flooded with hotels, cafes, tavernas, bars and nightclubs and its market meets the needs of the most demanding visitors, offering a great variety of souvenirs and traditional products. It is an extremely interesting destination for both lovers of past times as well as the present due to its archeological wealth, its natural beauty and its modern establishments.